While OmniReference Desk has some very nice built-in reporting capability with the option to view charts and run reports from individual forms, we know you might want to do more with your data. To export the raw data from each of the reference desk ticks, simply click on “Stats” in the main navigation bar and then “Export” from the left sidebar. The next step is to select the Beginning and End Dates for the data you’d like to export. Ticks – Each tick (or form submission) includes data on the Location, Desk, Contact Method, Form, User, Time Spent, and Time of Record. 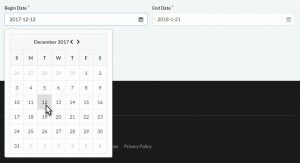 Fields – This report includes all of the form data from your custom forms. This report will include a row for each form field which can produce more than one row per Tick. Both – Using this option you can export each Tick as a single row, however, all of the custom form data will be combined into a single column.